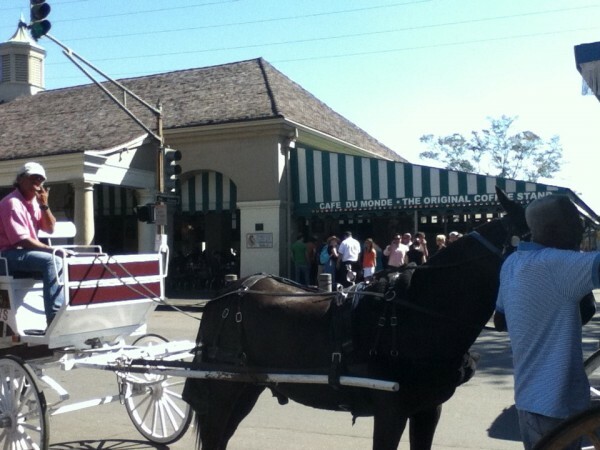 So there was something of the architecture of the French Quarter. Here's some of the things you can do (and see, and eat and drink) there. Of course, New Orleans loves its jazz! And if you go out through the French Quarter, you can see jazz combos just sort of playing on the street. I took a picture, but apparently, it didn't upload too well to Scrapbook, so I'll just have to leave it out. The one thing that I wish I'd been able to get a picture of, but didn't (again, problems with the light during the day, and you can't really see it at night) was Preservation Hall. Preservation Hall is a music venue that is carefully maintained to look like a rundown 1920s dive. Yes, that's a cheesy and touristy thing. 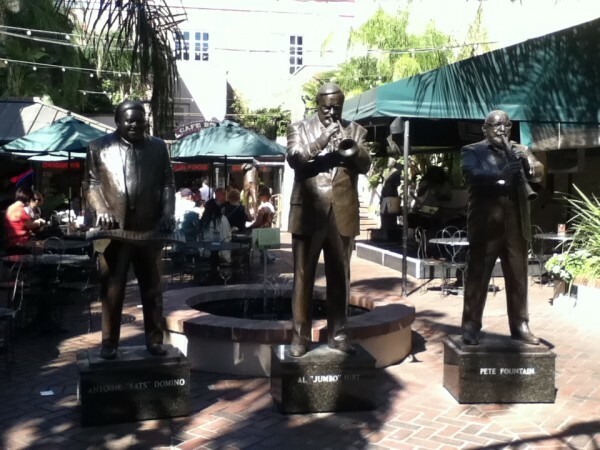 However, there is nothing whatsoever cheesy and touristy about the jazz bands that play there. They play old-time New Orleans-style jazz, and they are probably among the best bands in the country who specialize in that kind of music. It was entirely worth the ticket to go hear this music. Anyway, I'd been a little bit worried that I wouldn't be able to find any good Creole food that I could eat, because I don't eat pork, and I'm allergic to shellfish. But my friend found us the Gumbo Shop, where they serve a vegetarian gumbo (she said it was a recipe for Lent) called "Gumbo Z'Herbes." It was delicious, as was the rice and beans you could get there. And, of course, how could you go to New Orleans and not go to the Cafe Du Monde and eat beignets till they come out of your ears? I went with a colleague who was fascinated to know more about La Dissertation. We had our beignets at around six in the evening, which is a good time to do that, because Real People™ are out eating actual dinner at that time, so you can get a table and get your beignets pretty quickly. If you can find them beneath the mountain of powdered sugar, of course. My friend who lives in Pensacola drove the three hours to New Orleans to spend much of Saturday with me, just so we could hang out in New Orleans (I'm not in the South much, so we didn't want to waste the opportunity.) 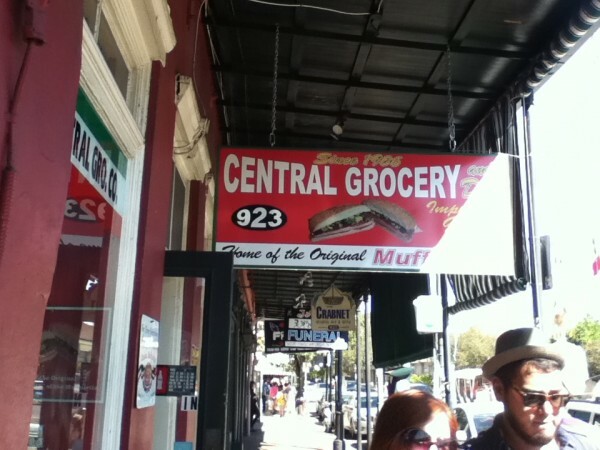 He loves Gulf Coast cuisine, and made sure to show me the Central Grocery, which is apparently the only place that produces the true olive salad that goes on an official muffuletta sandwich. They ship the stuff all over the country. Muffulettas are made with pork sausage, and I don't like olives, so I've never had one, but I loved the idea of the Central Grocery. 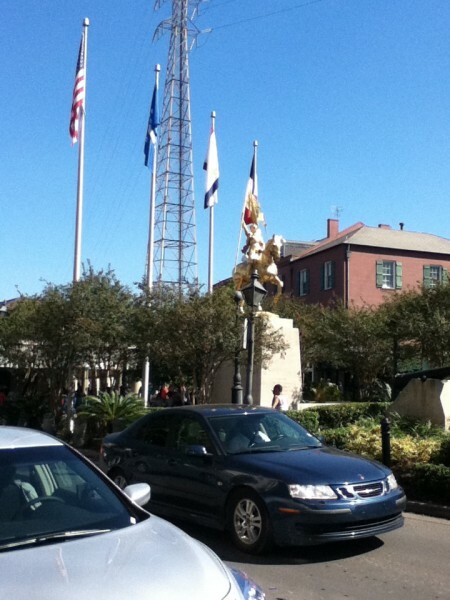 He also made sure to show me the statue of Joan of Arc that is just north of the Cafe Du Monde. It's one of his favorite things in New Orleans. We also walked around and through Jackson Park (named after that Colonel Jackson). The walk is lovely, but you have to be careful where you take pictures. There are a lot of artists who sell their work on the streets surrounding the park, and you're not really supposed to photograph their artwork. But you can take general pictures. 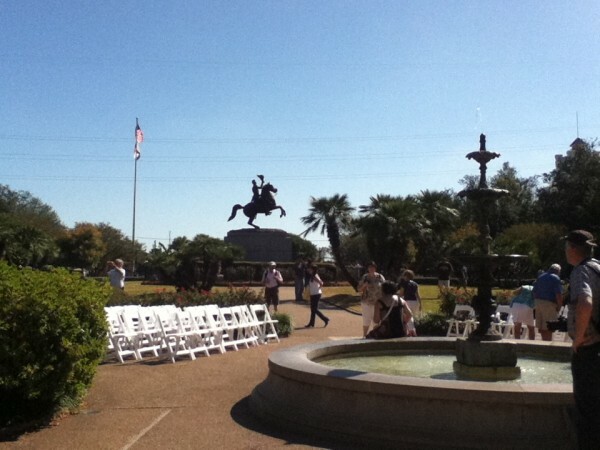 Inside the park itself, you can find a statue of Colonel Jackson himself. Also, for some reason, a stand of what my friend told me were banana plants. Why? Because. Finally, that church you can see behind the banana plants? 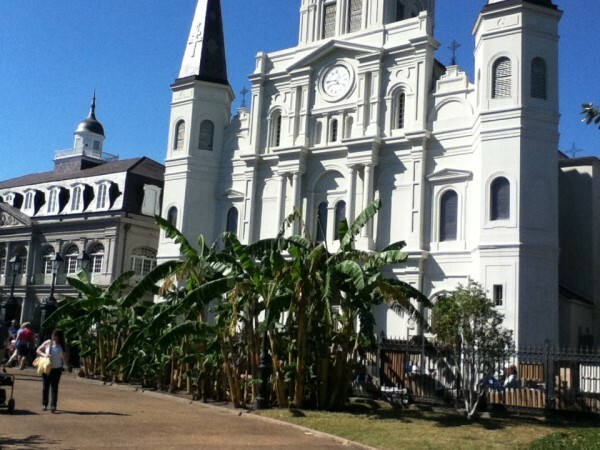 That is the St. Louis Cathedral, one of the biggest cathedrals in the country. 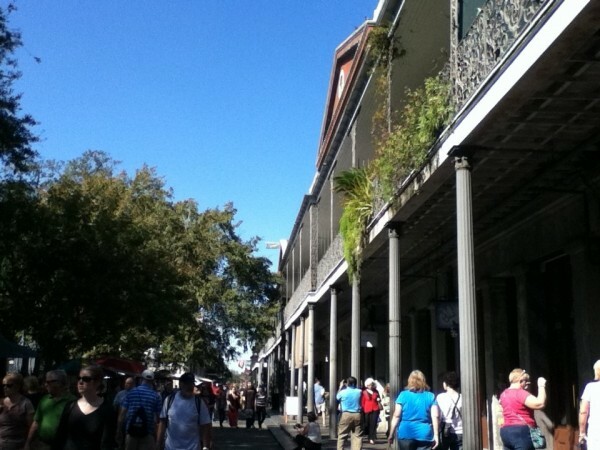 (New Orleans has a strong Catholic heritage, which most of the United States doesn't have.) 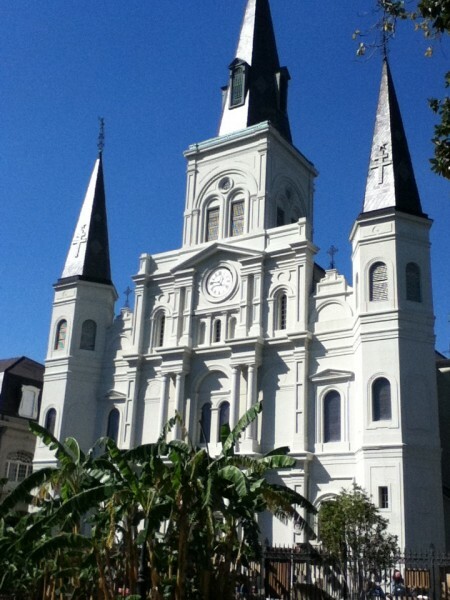 One of the things I'd love to do when returning to New Orleans is to check out that cathedral a bit more. So, those are the photos I have for you. Some of the rest either didn't turn out well or were portraits, which I don't like to show on LJ. But I did have a wonderful time. I think I'm working towards the perfect balance of conferencing and touristing around. 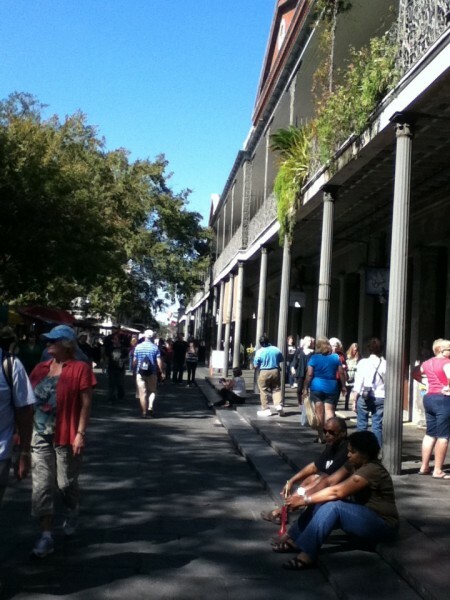 I will definitely return to New Orleans at some point, because there's so much more to see there. Unfortunately, next year's SEM conference is in Indianapolis. I suppose I'll go visit the Indianapolis Motor Speedway while I'm there. Why not? The weather looks wonderful. And beignets are so yummy. I've never been to Indianapolis that I recall. Sometimes conferences are in cities I don't remember because they tend to look alike, but I'm pretty sure I've never been there. We had four straight days of sunshine, and it ranged from "utterly comfortable" to "a little on the warm side," which is just fine for me, given that the alternative was to be in Chicago. The Cafe Du Monde seems at one point to have sold T-shirts reading "Official Hurricane Katrina Beignet Rescue Squad 2005." I saw a few people wearing those. Touristing is a great side to conferencing. I'm glad you had fun -and great weather! Especially for a music conference. How, as a musician, could I not ditch the conference to go out and explore? I could either go listen to more people talk about music, or I could just go out to Preservation Hall and cut out the middle-professor. I love conferences in fun places. It's a great way to get in all the nifty vacations that I can't really afford as a student. Oh this looks like so much fun. Again, great pics! I'm a little jealous. :-) Maybe I'll go look to see if they still hold my old conference, since I am pretending to be a college professor again and need to go back to reading at conferences. That's one I'd love to go to again. I'm glad the pictures turned out so well. I was using my iPod, because my camera has decided to go on the fritz, and the iPod camera doesn't do zooming, and it doesn't react well to strong strong light, but I'm very pleased with the pictures that I did get. And I love the iPod's video quality, so that's something right there. Very nice pics and sounds like you had a great time. I've only been there in sweltering heat. Would liked to have visited in nicer weather. November turns out to be the perfect time (as long as there are no hurricanes). It's warm but not swelteringly hot. We did get up as high as the mid-80s, but not to worry, The South Is Air-Conditioned! And I had brought short sleeves with me. In November, I was able to swan around in just a short-sleeved little silk blouse. How awesome was that? Really nice pics. Forgot to say that last post. If you like the New Orleans architecture, two other places you would probably like are Savannah, Georgia and Charleston, South Carolina. I don't think I fully appreciated the New Orleans music scene when I was there. 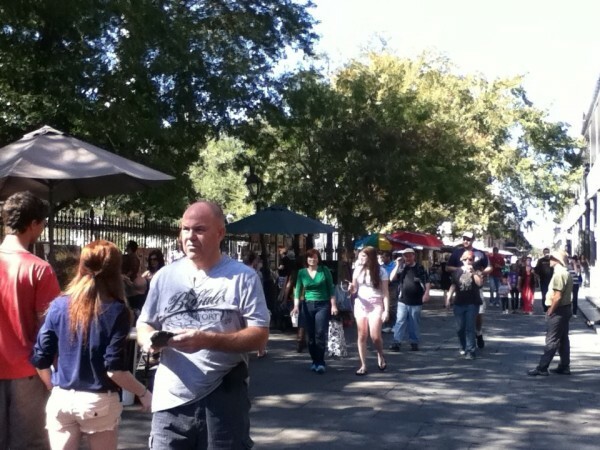 Although I probably didhear some bits of music just walking around the Quarter. Nowadays I listen to WWOZ online from time to time. At the top of every other hour they go over all the musicians playing at all the different venues. It takes them something like 10 minutes to do it! I just luv the name of the venue Chickiwawa's (spelling approximate). I'll make sure to find excuses to go see Savannah and Charleston, then! Although next up on my list of "places to visit that I haven't before" is Little Sister Pony in Charlottesville in December. And then possibly to visit a friend in Arizona over the winter. I thought it was a brilliant idea to have a music conference in New Orleans! 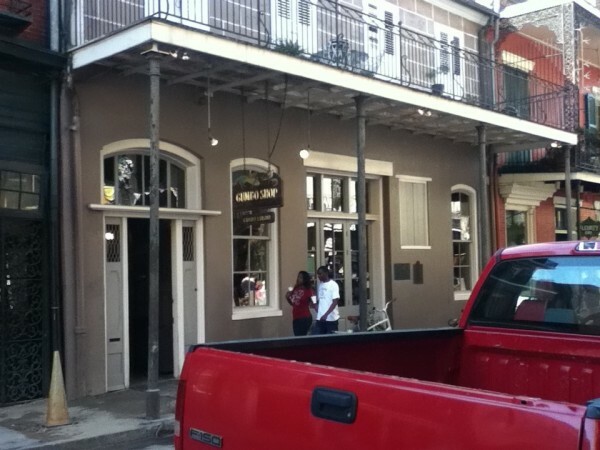 Even sneaking out to Preservation Hall didn't really seem like sneaking anywhere. You could listen to talks about music, or you could go and listen to music. It was perfect.